This past weekend at Grace Church, I spoke on the "big plan" of God throughout Scriptures. In doing so, I found a quote from David Nelson's chapter on "The Story of Mission: The Grand Biblical Narrative," in Bruce Ashford's Theology and Practice of Mission. "In order to build a biblical-theological framework for understanding God's mission, the church's mission, and the church's mission to the nations, one must first understand the unified biblical narrative, including its four major plot movements--creation, fall, redemption, and restoration." This "big picture" or "grand narrative" of Scripture is vital to what we are doing with The Gospel Project, as I have explained in several blog posts. Creation: One Hebrew word sums up the picture of Genesis 1 and 2: shalom. Peace. Earth was full of God's shalom, the kind of peace in which everything works according to God's intention. The world was made for human flourishing, there we could live in joy in the presence of our Maker, worshiping God by loving Him and one another forever. Fall: Adam and Eve rejected God's rule over them. We refer to their rebellious choice as "the fall," and because the represented all of humanity, their action affects us too. We have-- through our attitudes and actions-- declared ourselves to be God's enemies. This rebellion results in physical and spiritual death. 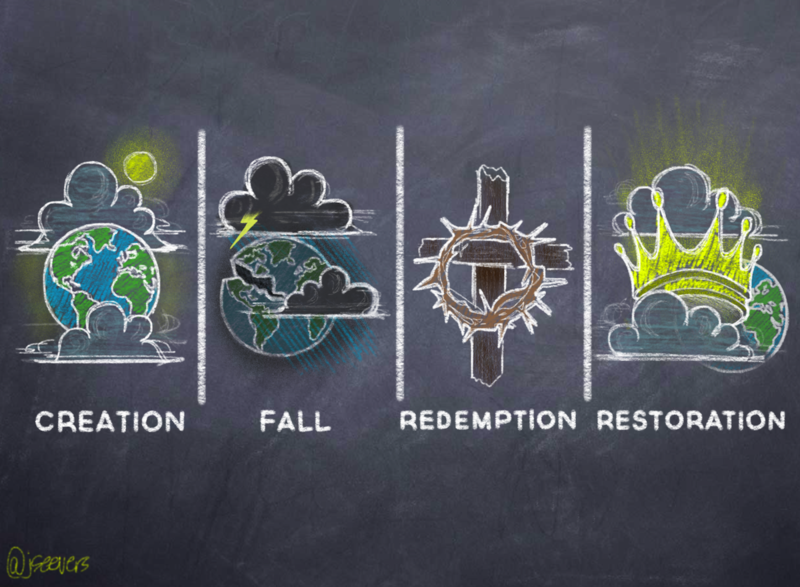 Redemption: Thankfully the loving Creator who rightly shows Himself to be wrathful toward our sin is determined to turn evil and suffering we have caused into good that will be to His ultimate glory. 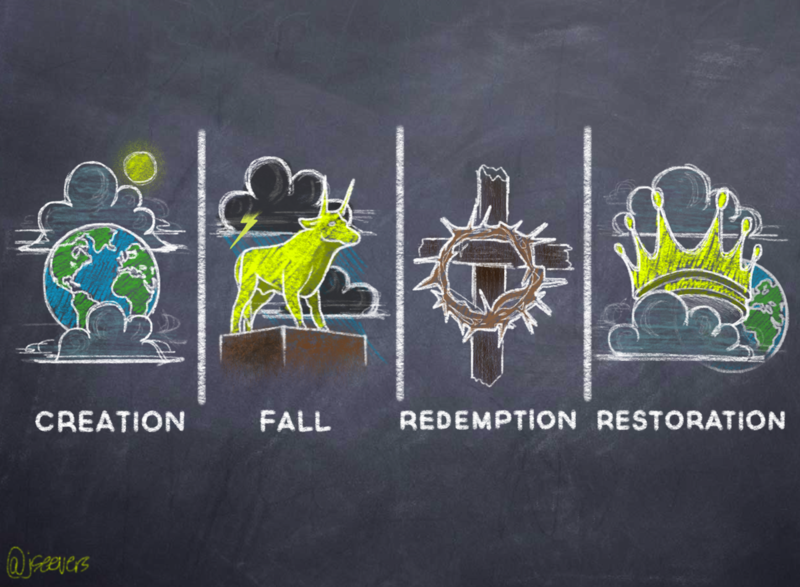 So the next movement shows God implementing a master plan for redeeming His world and rescuing fallen sinners. In the Person of Jesus Christ, God Himself comes to renew the world and restore His people. 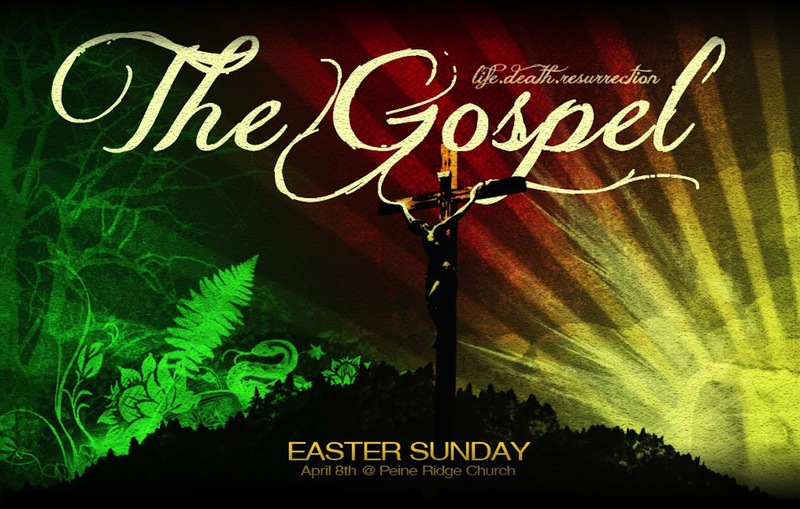 The grand narrative of Scripture climaxes with the death and resurrection of Jesus. 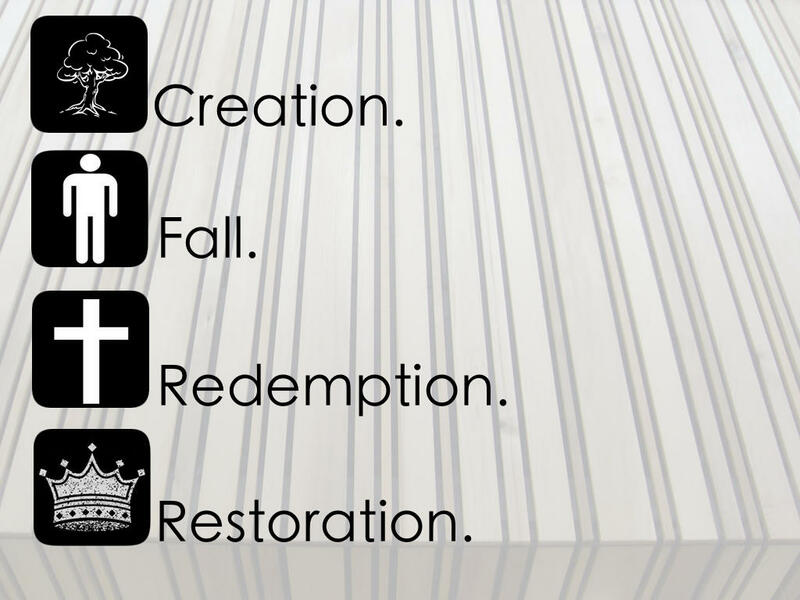 Restoration: The story doesn't end with redemption. God has promised to renew the whole world, and the Bible gives us a peak into this glorious future. The restoration of all things will take place in two ways. Christ will return to judge sin and evil, and He will usher in righteousness and peace. God will purge this world of evil once and for all. But while I can say that, it never hurts to show it as well. So last week, I took to Twitter to seek out imagery that would capture this big story. By the end of the week, I decided to use a graphic from Jeff Seevers, who does a great job as a designer. There were some others submitted as well (click the image to enlarge). I like several of them and am mulling them over-- and I want to invite you to do the same. My question to you, my readers, what might you change or add to these graphics? Do they correctly convey the grand narrative of Scripture? Are they understandable to the unchurched and helpful to mature believers? Feel free to weigh in below in the comments.